We were invited to be one of the first people to ride the new attraction and to have a day at the park. We got some goodies which included some rather fab Ben10 green T-shirts and some dress up things... well the children did anyway! 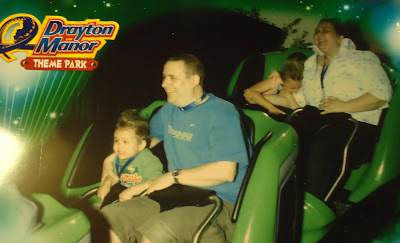 We quite like Drayton Manor as it is a family theme park. What I mean is that unlike some of the other theme parks in the UK this one has rides that the whole family will enjoy. It isn't just for thrill seekers or just for the children it is a combination of them both! As I mentioned in my Family Day out to Drayton Manor post there were plans to open a new ride this year in the main section of the theme park, a Ben 10 themed ride. When we were then asked if we would like to come to a special preview of the ride and ride it, two days before it was open to the public we couldn't say no. The ride is what is called a Boomerang and is the first Junior Boomerang in the world (A Boomerang is where you travel one way along the track and then go back travelling backwards!) and was built by Vekoma (trust me they know a lot about Roller Coasters) and looks fantastic! Even Daddy who isn't really that keen on Roller Coasters and doesn't know that much about Ben 10 agreed that it looked great. You have to be a minimum of 1m tall to ride with an adult, and 1.2m tall if you aren't being accompanied by an adult. You enter into a dark tunnel which leads you into Axmuth's lab, who is the alien that created the Omnitrix (trust me it makes more sense if you have seen one of the cartoon's or films but basically it is a watch that turns an ordinary human boy into Aliens) and it needs to be fixed before Vilgax (Big Evil Alien) tries to get it for himself. That is where we come in, as we have to activate a laser cannon to defeat Vilgax... which luckily we do! The question is though what did we make of the actual ride? Well, Top Ender and Baby Boy were on opposite sides of the fence (Daddy and I loved it!) and I thought it best to let them tell you what they thought in their own words. And now you know, you can see our picture that was taken when we were on the ride. I apologise for how naff this is, but its a photo of a photo as I can't make the scanner work! Yes, that is Top Ender clinging to my arm in terror and Daddy cuddling Baby Boy whose face is being pulled back by the 3 G-force pushing on us (that is what the space shuttle gets when launching or re-entering!) whilst Daddy and I appear to be giggling manically... It was some true Family Fun!